A thirteen mile walk is our objective today. 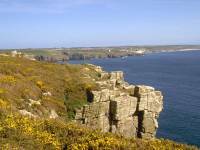 This section of the coast is considerably less rugged than that between Land's End and Mousehole. 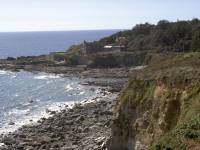 It includes several beaches and low-lying stretches with farmland and cropped fields adjacent, the first of the coast's holiday resorts and a couple of picturesque villages. 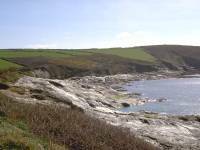 It is not without its share of cliffs and coves, however, and the scenery around Prussia Cove and at Porth Sulince is rewarding to explore. 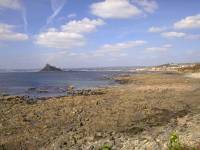 The highlight of the day's walk, however, must be St Michael's Mount just off Marazion. 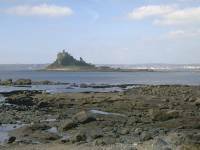 Connected to the mainland by a tidal causeway, St Michaels Mount is startlingly similar to Mont St Michel in Normandy on the other side of the English Channel. 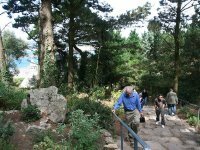 The castle that crowns its peak is a private residence but is partly open to the public, and its terraced gardens can also be visited at certain times of the year. I'll assume that you're beginning the walk from the environs of the bus station and railway station, next to each other at the eastern end of the town centre. 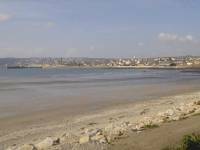 Your route lays initially along Cliff Road, to the rear (landward) side of the railway terminus. There isn't a cliff at all, but "sea wall road" doesn't have much of a ring to it. This end of town is rather utilitarian. 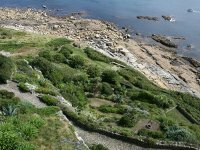 Once you pass the helicopter terminal (from which you can get flights to the Scilly Isles off Land's End), cross the railway line by a footbridge. You've arrived at a locality known as Long Rock. There's nothing much here apart from the beach, the odd row of cottages and various bits of railway infrastructure such as the carriage cleaning depot. There's a path (and sometimes a vehicle track) just to the south of the railway track - you can choose to follow this, or to walk on the sands if the tide is out. With no scenic highlights to detain you the walking is simple and swift. 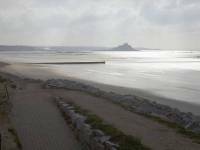 Eventually the railway veers off to the left, to cross a neck of low-lying and marshy land (Marazion Marsh) en route to Hayle on the other coast. 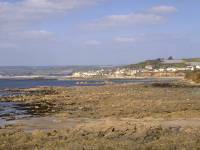 Amazingly, you will already have walked three miles by the time you reach the western outskirts of Marazion. 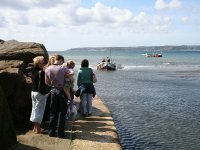 Marazion is a pleasant, compact little town with a handsome cobbled market square. 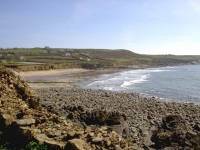 There's no beach - the foreshore is rough and rocky - and in fact the coast path route abandons the coast itself to follow the road out of town to the east for more than half a mile before turning right down a lane to arrive at the rocky enclave of Venton Beach. 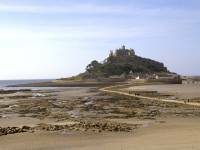 Before you leave Marazion, though, spare some time to visit St Michaels Mount. 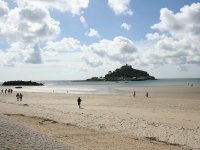 St Michaels Mount dominates Marazion and is a roughly circular island, about 300m across and lying 600m offshore. 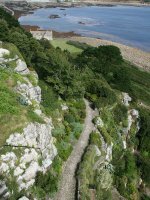 The coast path's official guidebook is annoyingly reticent about the Mount, declaring only that it is the site of a former monastery and is now in the ownership of the National Trust. 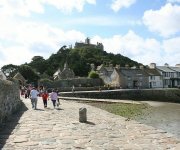 It is a visually arresting sight, an almost perfectly conical hillock topped by a castle, and part of its appeal lies in the fact that access is on foot by a causeway that is covered at high tide (when a ferry operates as an alternative). 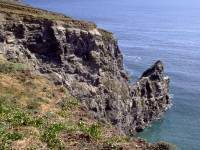 There is no information anywhere about the island's elevation, but it must be around 200ft. 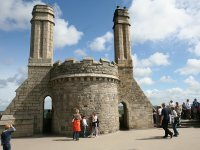 As well as the castle, the Mount is home to a small "village", essentially a cluster of National Trust retail opportunities plus a few barns and outhouses. 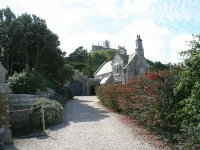 The castle itself is a private residence in the ownership of the St Aubyn family, but much of it is open to the public. 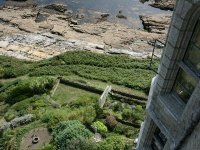 A particularly special feature of the castle is its extensive terraced gardens, which lay mainly on the seaward side. 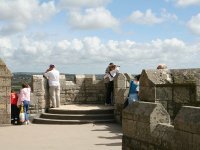 Opening times of both the castle and the gardens vary and information available online is not only vague but actually contradictory - check with local tourist information offices. 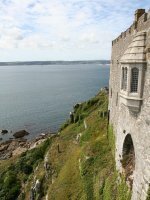 There's an entrance fee for the castle, of course, but access to the island itself is free. 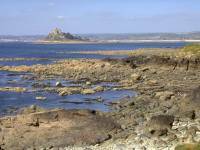 If you followed the directions in the last paragraph, walked out of Marazion to the east and then turned down the lane to the right, you've found yourself on a small, rough and shingly patch of foreshore that rejoices in the name of Venton Beach. 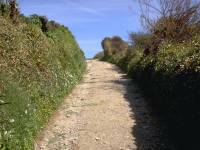 The path crosses the shingle for a few yards and then mounts a set of metal steps to gain access to the low shelf of land just above. 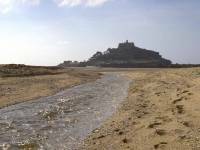 The highest tides tend to cover Venton Beach completely so time your arrival with care. 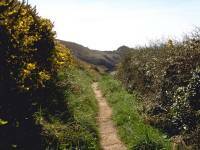 The next two miles of coast path are most unusual. 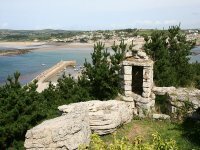 The terrain to your left is ordinary farmland and you will find yourself walking along the edges of fields sown with crops, a novelty not repeated on the End-to-End until you turn inland beyond Plymouth. Here and there the original coastline has eroded and the path is subject to local diversions, typically one field width away from the coast. This section is centred around the small village of Perranuthnoe. 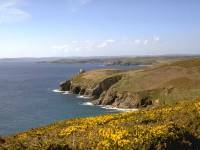 Beyond the village the fields begin to recede inland and the standard Cornish coast scenery of cliffs and coves starts to reassert itself as you approach the rocky promontory of Cudden Point. 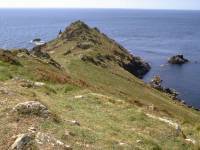 Cudden Point itself is a narrow and fairly isolated headland, quite dramatic in its own way. 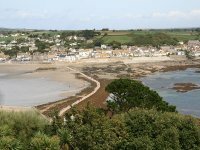 Just inland is the Acton Castle hotel, once the home of the Praed family, for whom Praed Street (on which stands London's Paddington Station, at the other end of the railway line from Penzance) is named. 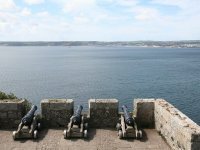 The headland affords good views, retrospectively back across Mounts Bay and forward along the full sweep of coast to the Lizard, over twenty miles distant yet. 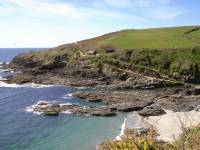 Prussia Cove is a locality rather than a coastal feature. 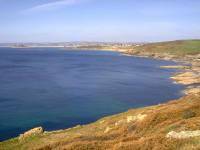 The name actually embraces three coves that follow each other in quick succession: Piskies Cove, Bessie's Cove and King's Cove. 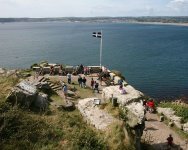 The name is derived from the so-called King of Prussia, an eighteenth-century character with a prominent place in Cornwall's colourful history of smuggling. 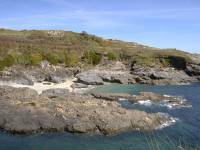 Bessy's cove is narrow and deep, while King's Cove is really just the western corner of the succeeding bay. 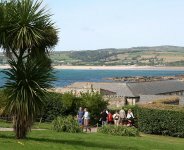 It's surrounded by lush vegetation and also features some interesting architecture; one pair of properties is built in the shape of two facing crescents and the coast path goes through the central courtyard. 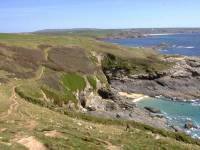 The path rises smartly to a clifftop beyond King's Cove and comes out quite suddenly at Kengenny Sands. 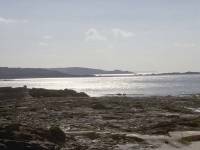 The beach at Kengenny is perhaps four hundred meters long by two hundred meters wide at low tide. 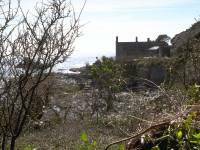 It was deserted when I passed it in the spring of 1995 but perhaps that's explained by the lack of an access road. There's a campsite about 500m inland at Higher Kengenny farm. 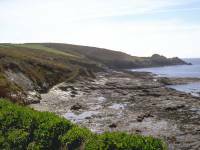 The coast path runs along the clifftop above Kengenny Sands then drops gradually in altitude along the next kilometre, running past a nondescript rocky foreshore out to the minor headland of Hoe Point. 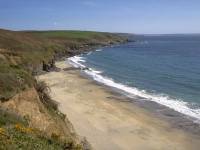 Praa Sands is remarkably similar to Kengenny Sands just behind except in two respects: it's rather more extensive (a good kilometre and a half in length) and it's developed. 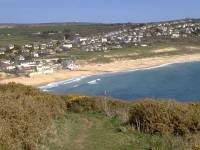 In fact Praa Sands is the first "resort" village met along the coast path, a place largely built for the holiday industry. The place has some accommodation including two campsites, and there is almost certainly a beach cafe here although I didn't actually remember seeing one. 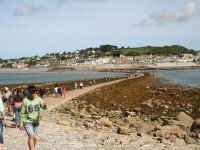 The coast path runs along the promenade, such as it is, then mounts a surprisingly rough area of sand dunes behind and east of the beach. 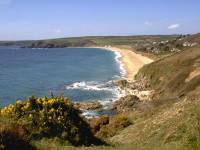 From here you climb up to the gorse covered Rinsey Point, from where there's an end-on view back along the beach. 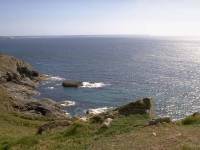 There's some nicely rugged coastal scenery just beyond Rinsey Head as the path rounds the little cove and tiny beach of Porthcew. 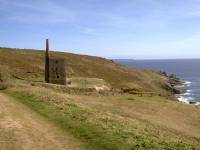 Here there stands a little piece of Cornwall's industrial heritage, the engine house and chimney of the deserted Wheal Prosper tin mine. 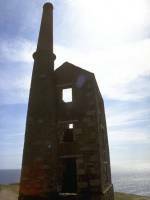 There are dozens, if not hundreds, of identical structures dotted around the Cornish landscape but this is the only one to be found on the south coast. 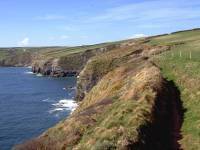 Beyond the cove the path reaches the minor headland of Trewavas Head, from where Porthleven comes into view. 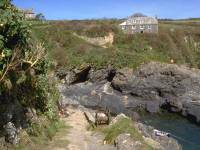 The final two miles into Porthleven lays along a section of the coast composed of slate rather than granite, which gives rise to a subtle difference in the rock scenery. Although gorze-covered slopes still predominate there are several areas of relatively new, vertical cliff. 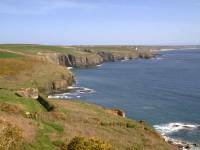 Parts of the clifftop are fenced off from the path and the standard guidebook carries the warning that this part of the coast is prone to slippage. 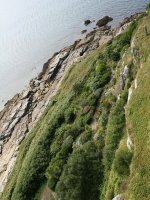 Don't be too alarmed by this, landslips tend to number just a tiny handful per century and usually occur during rough winter storms. 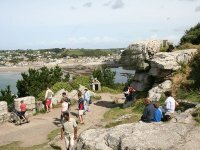 But be sure to follow any diversions that are posted and don't be tempted to explore. 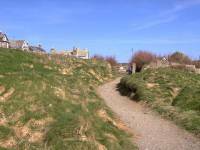 The coast path enters Porthleven fairly suddenly, as the village has not really spread much westwards of the harbour. 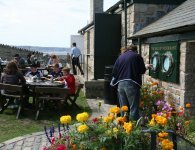 The old centre of Porthleven is a pleasant enough place, built around the three sides of the square harbour much like an inland village would be built around its green. 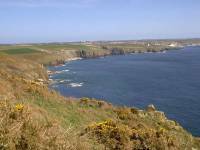 Porthleven has grown to the north and to the east. Northwards from the centre you find an unscenic jumble of residential roads and eastwards is a relatively shabby area given over mainly to holiday cottages. 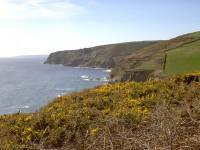 That's our route out of Porthleven towards Mullion and the Lizard, but that's for tomorrow. 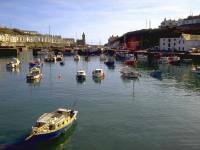 There's a smattering of bed and breakfast establishments here in Porthleven, otherwise you'll find the bus halt on the north side of the harbour for services to Helston, Penzance and Falmouth.